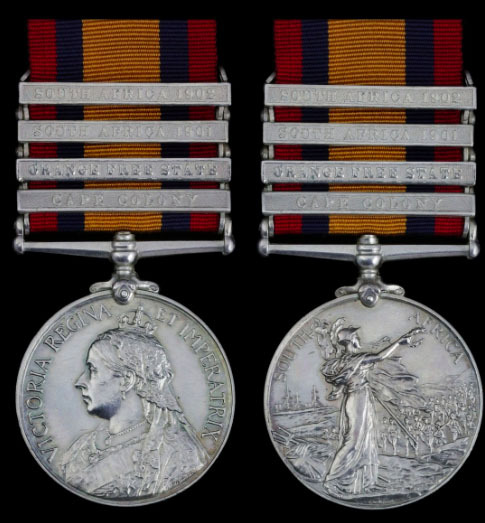 Well, he was certainly not entitled and could not have actually earned that particular clasp, given his service, I would think the medal has been messed around with at some point, with the intention to deceive, I hope you did not pay too much for it. Okay, well, in that case, on the plus side, it is a very easy task to restore and certainly not an expensive one either, I would not be unhappy and it is not as though you have the annoying KSA to try and find, a typical Thomas Atkins serving in a very good regiment. Russell Loscombe Stable was born on 23 February 1866, the son of Robert Scott Stable. He initially served with the 3rd Battalion, Essex Regiment, before being posted Lieutenant in the Loyal North Lancashire Regiment on 27 April 1886. Promoted Adjutant on 6 July 1897, he was mentioned in the final despatch of General Kitchener for services in South Africa (London Gazette 31 October 1902, refers). In 1911, he retired to Fulwood, Preston, Lancashire. His son, 2nd Lieutenant Russell Colin Stable died on 9 October 1917, whilst serving with the Royal Warwickshire Regiment. KSA (2) (4653 Pte. R. Hughes. L. N. Lanc: Regt.). Richard Benbow Hughes was born at Liverpool and attested for the Loyal North Lancashire Regiment on 15 October 1894 after previous service with the 3rd Loyal North Lancashire Militia. He was posted to the 2nd Battalion on 24 November 1894, but on 2 January 1897 deserted. He rejoined to Civil Authorities twenty-four days later and was placed in the Guard Room on 1 February - tried by District Court Martial he was sentenced to 84 days imprisonment with hard labour. On 13 December 1897 he was posted to the 1st Battalion. 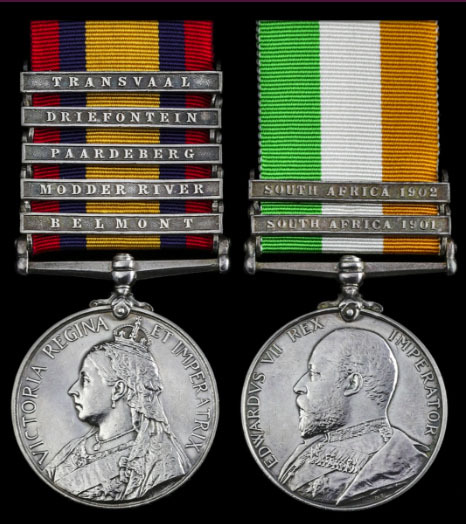 Having served in Ceylon and then nearly 4 years in South Africa, during the Boer War he served in the Mounted Infantry and was taken prisoner at Sanna's Post. Later released, he was wounded at Belfast on 6 December 1900 and was eventually discharged on 4 February 1904. 10 other ranks of the 1st Battalion were taken prisoner during the encounter.